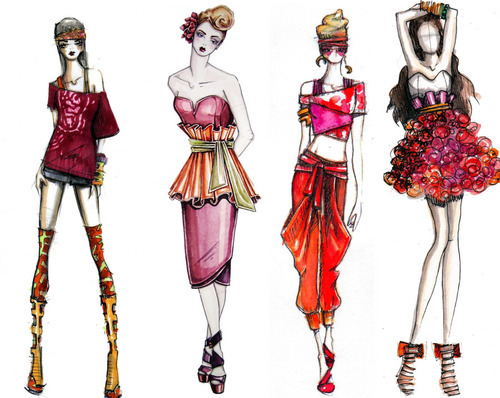 Easy way to get your fashion design expirience. Learning to draw fashion can be difficult, and it can be tricky if you don’t know the tricks of the trade. The good news is it can be a lot easier to become a professional fashion artist then your think! There are many ways to learn how to draw, and the first step should be learning to draw the female figure. The fashion figure is a model stance for fashion, and it is slightly different to that of a female figure. Usually the model is taller and leaner, and has longer legs. The best way to start drawing fashion is to use a ‘croqui’ or fashion figure template. This is an already drawn fashion figure that you can simply trace over, and draw your fashion designs on top. It is the quickest and easiest way to draw your designs and make them look professional. Here is an example below of how you can use a fashion figure template. The first step is to trace with a pencil the outline of the female figure. Trace over the torso to give you a clear defined shape to work with. Then start to draw your designs on the torso. The next step is to then trace over the arms and legs of the figure. You can then move to the head, and draw in a face and hair. Final step is to draw in your accessories like necklace, shoes, and bangles. From here, you are ready to start to colour or render your designs. Shade in the clothes, then the skin tone. Finish with a black fine tip pen to trace over the outlines of the clothing, and figure. And there you have it: a professional fashion model wearing your fashion design! Now you can file it in your portfolio for safe keeping! 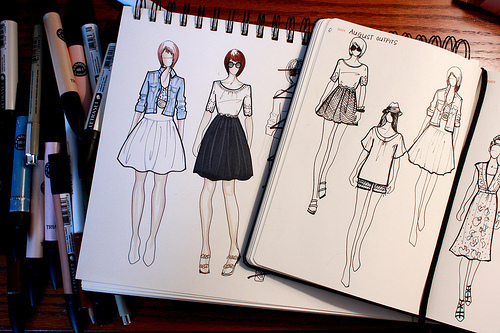 Keep on practicing drawing your designs in this way, and before you know it you will have a complete Fashion Collection !